First off, I would like to apologize for making a Top 10 List post. I realize top 10 lists are way over done and lazy writing in general, but there is a reason I made this list. You see, when I first moved to Glacier Bay National Park in remote Alaska, I didn’t know there were 10 things you could do in the area. I thought the best experience possible would be to fly in, take the 8-hour boat tour up the bay, and fly out. After a summer here, I realize there is so much do to and see that the area merits a stay of at least four days to appreciate it all. This is an incredible destination. Kayaking in the same water as 40-foot long humpback whales and 2000-pound sea lions is equal parts exhilarating and nerve-racking, and you don’t have to go far to do it. The front country waters near Bartlett Cove are full of wildlife, including whales. More adventurous kayakers spend multiple days up the bay or in the Beardslee Islands camping and exploring. Flying over Glacier Bay in a small airplane is utterly mind-blowing. 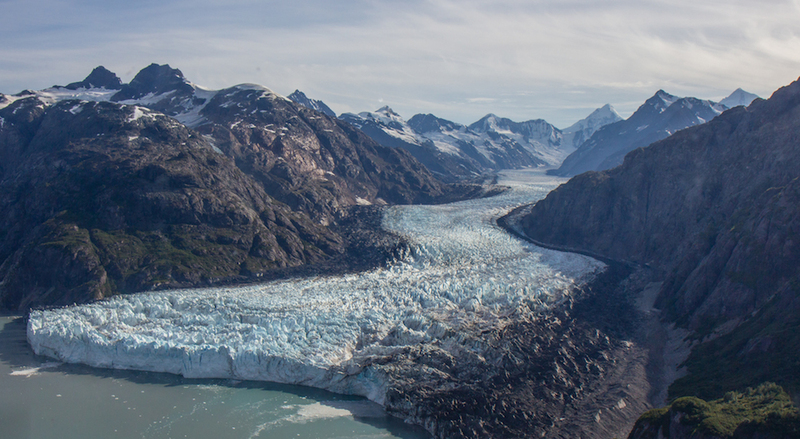 Getting an eagle’s eye view of the glaciers, ice-fields, canyons, alpine lakes and waterfalls is truly unforgettable and could wind up being your favorite experience in Alaska. If you can only do one thing in Glacier Bay, it has to be the boat tour. The daily boat cruise (in summer) travels 120 miles round-trip up Glacier Bay, visiting tide-water glaciers and offering glimpses of orcas, whales, sea lions, otters, bears, wolves, mountain goats and a wide variety of sea birds. It isn’t as exhilarating as kayaking or flight-seeing, because it is also a chill way to see the bay. You can drink hot chocolate (or beer or wine) while watching the world pass by and go outside when you see animals or glaciers. 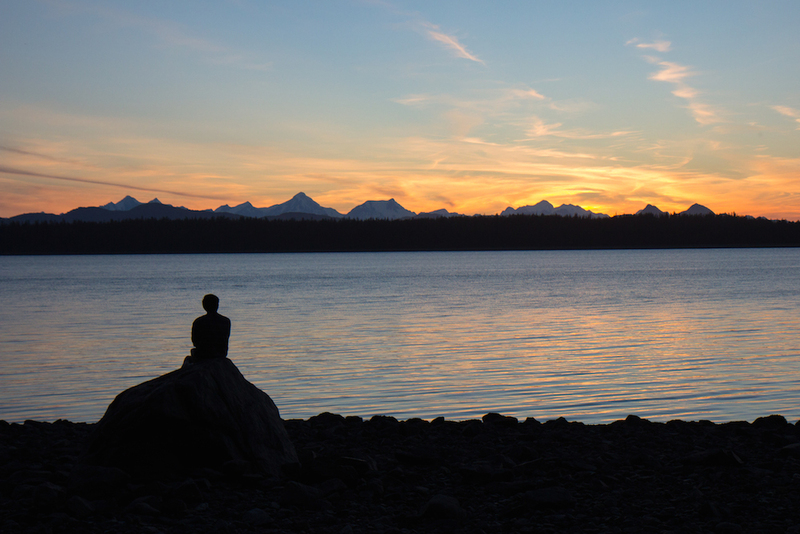 When the sky is clear, a short hike to Halibut Point near the Glacier Bay Lodge leads to views of a magical sunset. 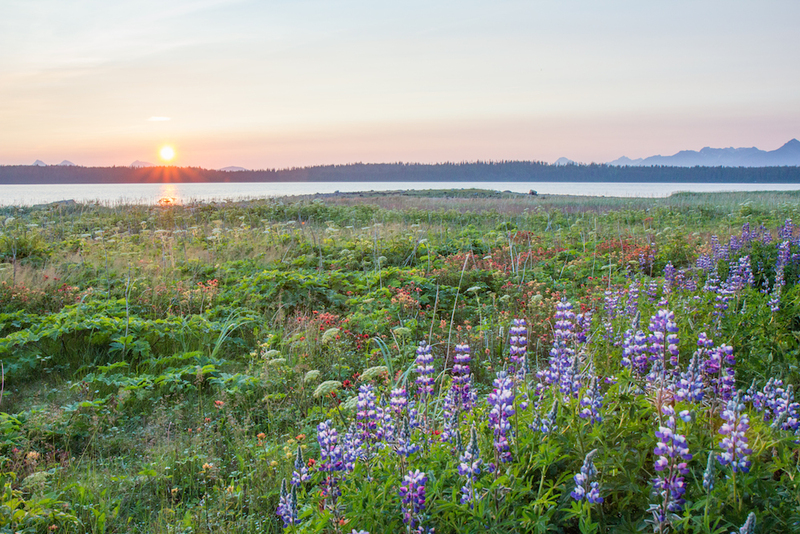 From May through July, wildflowers cover the meadow near the small peninsula and sea birds, bald eagles, whales, otters, porcupines, bears and sea lions are active near dusk. It is pure bliss. Mushrooms in the rainforest in Glacier Bay. Two excellent trails, the Forest Loop Trail and the Bartlett River Trail, go through the temperate rainforest. This is a magical world where moss clings to everything and an assortment of mushrooms grow on the ground and dead trees. 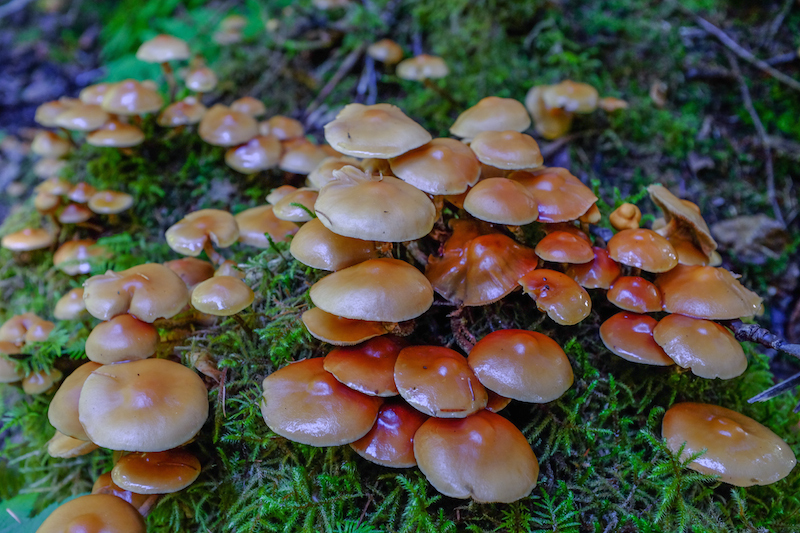 To make a forest hike more adventurous, eat some of the mushrooms, which range from delicious to deadly to hallucinogenic. At low tide, it is possible to see beds of mollusks and barnacles, and find jellyfish, starfish or octopus that have washed up on shore. Sea birds use this chance to forage for small critters. Occasionally, bears can be seen foraging for food on the shore too. 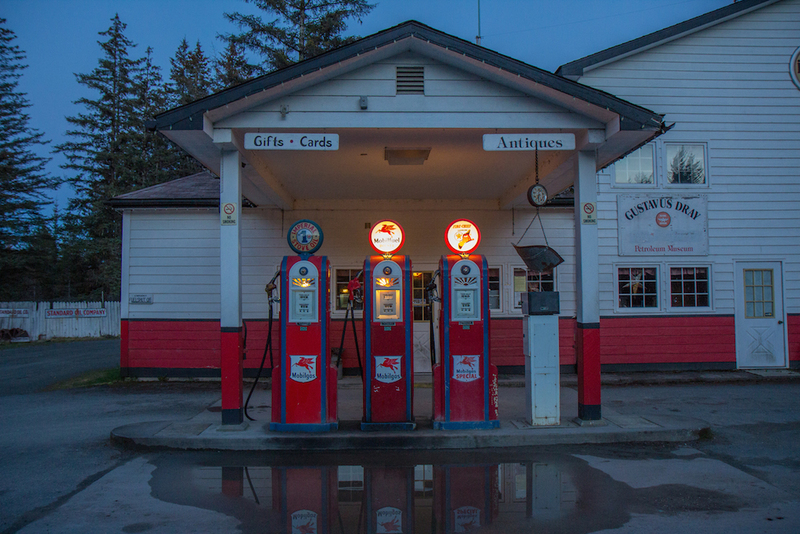 Gustavus, Alaska, population 400, is actually a fun, wholesome little town. It lacks the rough-and-tumble bar scene of many Alaskan towns and is nothing like the tourist traps of Juneau or Skagway. Instead, there are two small coffee shops, a little restaurant, and a liquor store that is only open a few hours a day. It is a great place to get a beer or coffee and meet the locals. Warning: everything closes by 8pm! 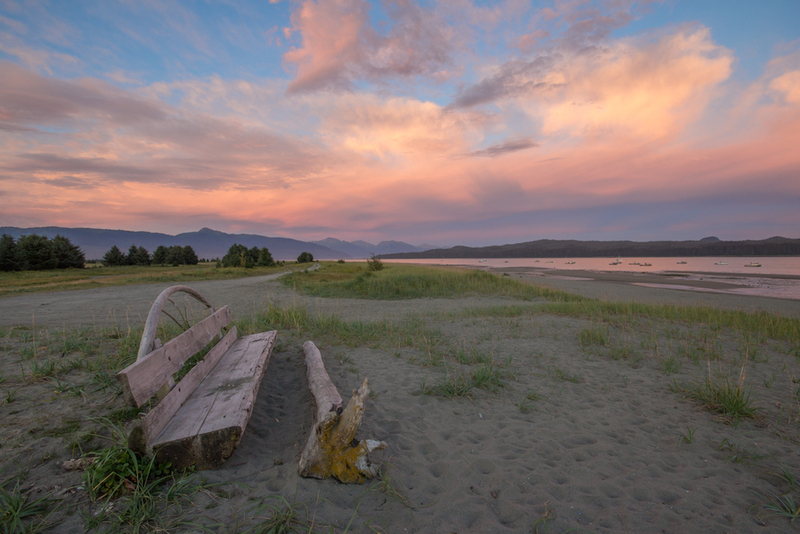 About a mile from the town center is the the wide-open beach of Gustavus, with sweeping views of the Fairweather Range and Icy Straight. 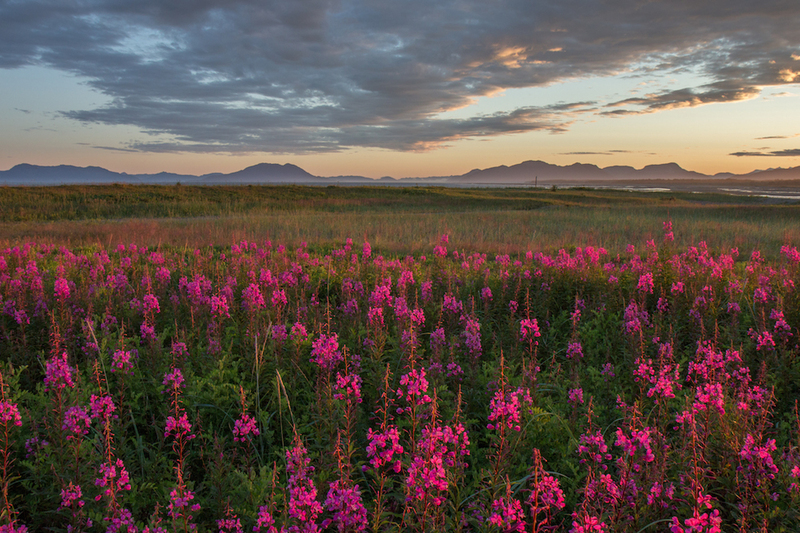 Fields of lupine, fireweed and cow parsnip add tons of color to an already stunning location, and bald-eagles are often seen soaring overhead. 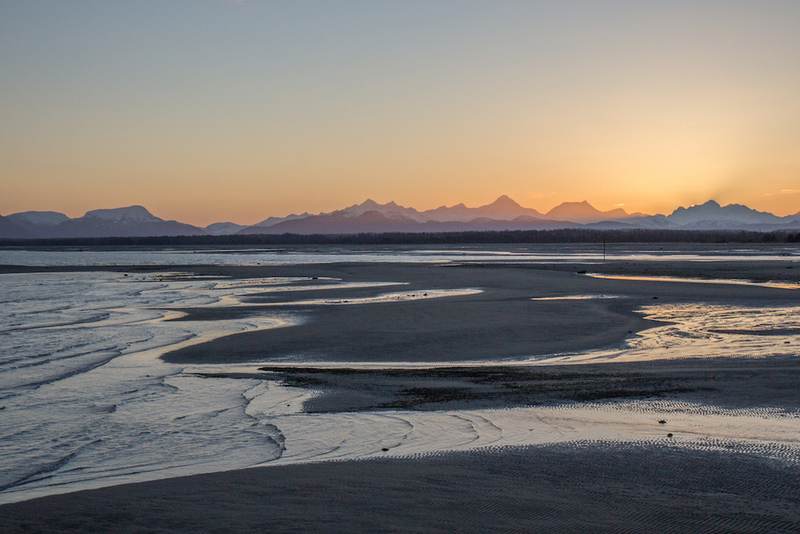 It is a great place for a sunset stroll along the beach, an activity not usually associated with Alaska. The Huna Tribal House, which opened in 2016, is a stunning new addition to the park. Carved entirely by hand, every inch of the house and totem poles is a work of art. Visiting the house and listening to a ranger presentation is a must do activity. The modern history of the Huna natives is fascinating. There is no cell phone service in the park, WIFI is slow, there are no TVs at most of the lodges. It is a great place to disconnect from the world and get back to nature. This is a rain forest after all, and if you have the time to spare, do a day of nothing. Take a nap with the rain falling on your roof, read a book while drinking a coffee and looking out over Bartlett Cove. There are a lot of things to do in Glacier Bay, but one of the best activities is doing nothing. Which activity would you be most interested in? 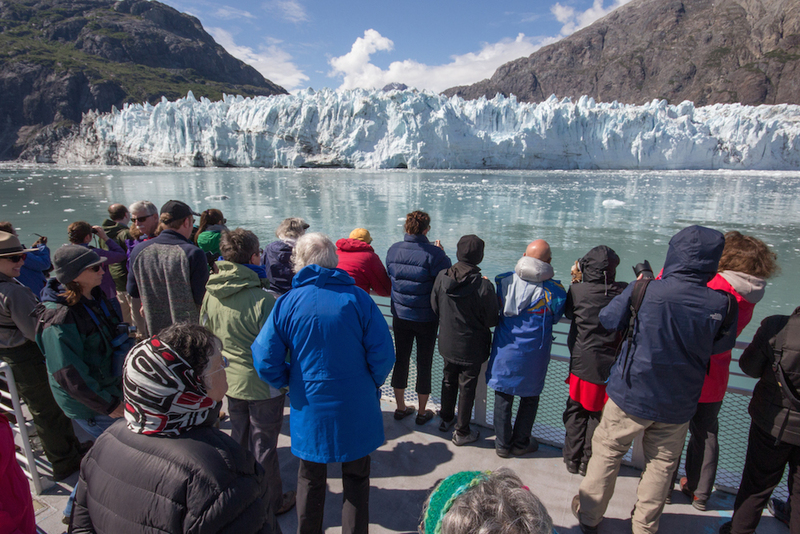 Do you have any other tips for visiting Glacier Bay? Thank you. I am glad my top 10 list passed the test. 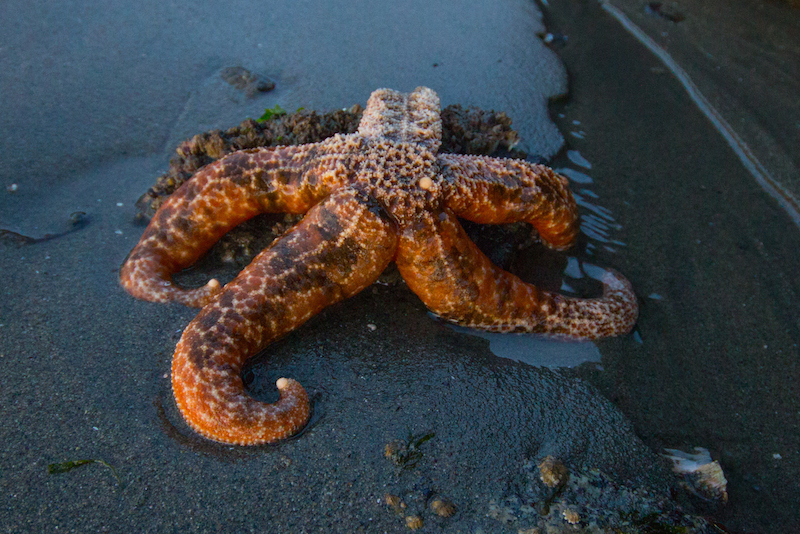 That starfish was huge and there were several others clinging to a nearby rock waiting for the tide to come in. In the last two weeks the forest has erupted in mushrooms. It is pretty cool to see the variety of them. Sign me up for all 10! My husband can hang out and do the “nothing” while I kayak. I doubt I could get him into the bay, but I’d be game for it. It had been great following you during your time there this year. So many great things to see and do! Thanks Laura. The great thing about kayaking is that you don’t have to go far to really enjoy it. We paddled about an hour across the cover saw several whales. Returning was slightly unnerving – we didn’t want to get too close to a whale and get tipped over! You, again, have made my heart sing with the shared beauty of Alaska. Thank you Jo. It is an incredible place that never ceases to amaze me. Two nights ago I saw an amazing northern lights show (photos coming). I keep thinking I’m running out of things to share and then something amazing happens again. It looks like an beautiful and dramatic landscape. Isn’t activity 9 (sunset in Gustavus) really the same as activity 8, though, since they kick you out of everywhere at 7pm so there’s nothing else to do? Yes, good point. I have since realized that one place stays open until 8pm, and there is always heavy drinking available also. I think I would like to tackle each & every one on your list Jeff. They are all such incredible experiences! Jeff I don’t think there is anything lazy about giving travellers an easy way to find information. Nothing drives me more wild than reading 25oo words about an incredible place and still not know where to start. At any rate I want to do them all! Let’s start with kayaking shall we? Agreed about the top 10 list, Sue. It is annoying not to get practical info sometimes. Kayaking is the best place to start. After you do that, you can chill on a boat tour and relax! Super outstanding post! Love the top 10! #8 was a bit unexpected – hanging around the gas station? 🙂 hehe:) I think I would go for the kayaking! Yes, hanging out in sleepy Gustavus is a little different, but surprisingly fun. 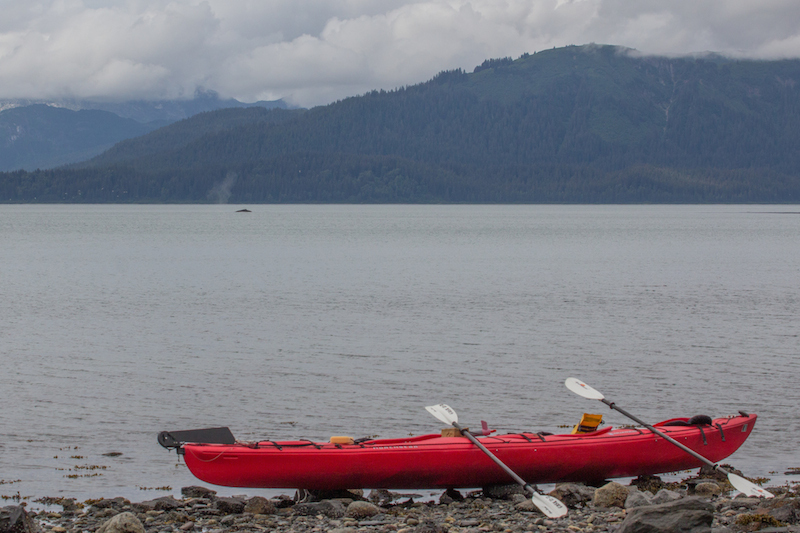 Kayaking is a blast – a must do in Alaska. can you see Northern lights in late June ?? No, there is not enough darkness at that time – it is light nearly all day.